Did you know that filler is a great alternative to rhinoplasty? It is the perfect option for people who want to improve their nose just a little bit, but not so bad as to go under the knife and bear all the downtime and stitches. True, the results are not permanent, but it also means that if the outcome is not as you expected, you won't be stuck with it for the rest of your life! How safe! One thing to understand before considering filler: it is not surgery. It uses a safe substance called hyaluronic acid to add volume to certain areas but cannot affect the position of the bone - which means it does not make a broad nose narrower or your nostrils smaller or anything like that. What it can do is define your nose a little bit more, as well as sharpen/heighten your nose bridge. And as simple as a dermal filler injection may seem, there is a lot more to it. Therefore, find a board-certified dermatology specialist who understands the skin structure and has experience. Filler is a procedure that, when gone wrong, can lead to serious complications. You should be treated by a doctor, not aesthetician or nurse, who knows what he or she is dealing with. 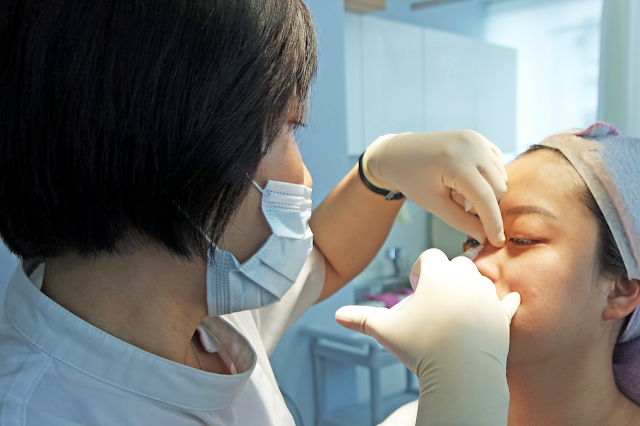 The procedure goes as such; after about 30 minutes of applying numbing cream, the dermatologist will design the treatment area and discuss one last time about the results to expect for your nose. 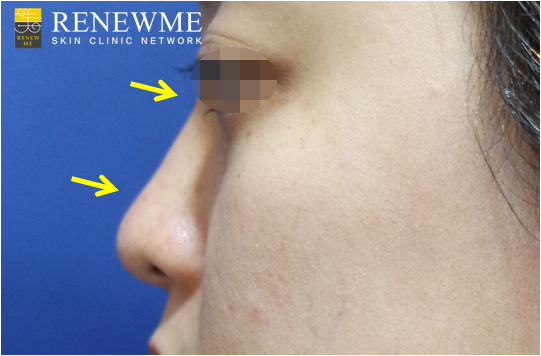 Then a series of injections, while the doctor injects and molds along the way to achieve the ideal and perfect shape for your nose. 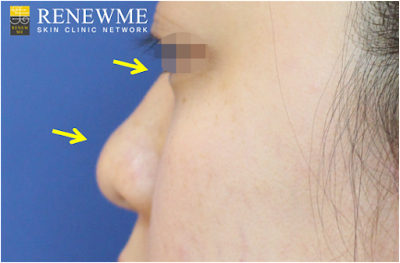 Rachel here has mentioned in her blog post, that Dr. Ha of our Jamsil branch was very meticulous with her injections and took extra care and time to make sure the results were spot on. Rachel was very satisfied when she checked herself in the mirror afterward! And as you can see in the before and after photos above, the results are subtle but noticeable. Her nose has become naturally enhanced - and what's even better, she can go out and shop and walk around and go to work and no one would even notice that she had something done! Patients may feel soreness for a few days but other than that the downtime is ZERO.